Charles Jones and Marc Weaver present an eighty-year-old garden in transition. Visitors today are seeing the beginning of a multi-year project to reimagine, rearrange and transform space in this .75 acre plot. When they moved in two years ago, Marc first removed several front yard trees to open the garden and house to neighbors and walkers. 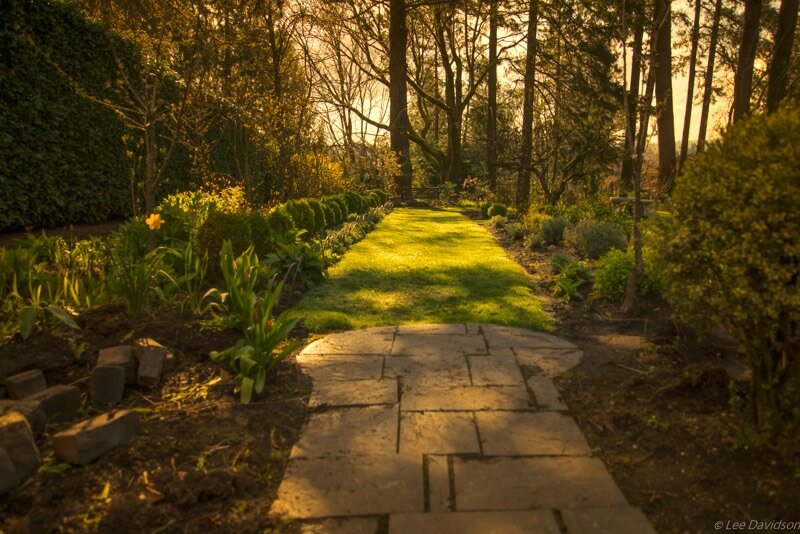 A grassy path now winds through the wide beds filled with hellebores and ferns, foxgloves and other reseeding natives from the road to the front door. In back, a 1930s brick patio and barbecue are a reminder of the Sylvan Brickyard that supplied bricks for many midcentury houses and patios throughout the West Slope area. Marc has connected the house to the patio with a boxwood lined crushed granite walkway and another open space with room for cafe tables and chairs. In the future, another boxwood enclosed area will become a private space of contemplation. From the house, looking into the deep lot where an old mossy-limbed maple stands, Marc says he envisions a woodland garden under the old growth firs to be accessed through arbors and winding paths. Aged camellias, magnolias, rhododendrons, and evergreens remain from another Marguerite Norrbo’s influence. To the west lies a large, open vegetable garden and berry patch. Intermixed throughout are fruit trees: apple and pear, cherry and plum. On the west side of the house, a memorial garden provides yet another place for quiet reflection.